recently i heard from an old friend recommending i give a new product a try. she has been using it herself and raves about it. the cloths shown above are Norwex cleansing cloths. each cloth is woven with silver which inhibits the growth of bacteria and other microorganisms. this means that when you are done using the cloth, you rinse it, wring it out, hang it to dry and it won't stink! seriously. you can use it for the better part of the week before washing it. a typical wash cloth will grow 800 new bacteria for every one in 24 hours. gross. the Norwex cleansing cloths will not allow bacteria to grow or replicate inside them making them a much cleaner option. they are also a great option for those of you who are eco-concious. no harsh chemicals, no unknown ingredients and less waste. 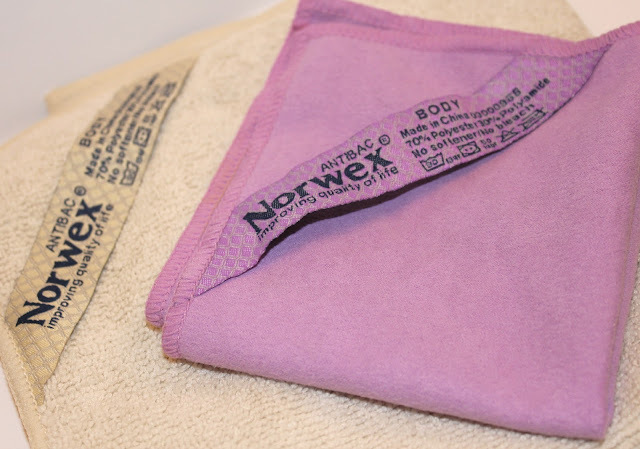 the purple cloth is specifically designed for removing makeup. it was suggested i try it a few times before making judgement and i am glad i did. using this cloth takes a bit of getting used to. it effectively removed my makeup but the makeup residue took some time to rinse from the cloth. the tan cloth is my friend's favorite. it works well at removing makeup but tends to be a bit more exfoliating. this was also my favorite of the two clothes. i wear more makeup than the average chick, which means i need a bit more cleansing than the average chick. this is also a good option for helping fight acne and blackheads for those of you with uber sensitive skin. if you would like more information on the Norwex products or the items listed above, check out Megan's website here. if natural products are your thang, then you should definitely check out Use Me hair products. they are Vegan with organic ingredients, BPA free packaging, sulfate & paraben free, refillable in salon and made in the USA. I would love to try one these. It seems so easy! ooooo, i would love to win one of these....less laundry is always a bonus! I keep being unable to attend her parties to check these babies out, but really want to! I've just been out of town . .. . thanks! I love norwex cleansing cloths! I would love to win some!